As a supporting and loving fan of Hayao Miyazaki’s, watching this film came naturally to me. After checking the mailbox several times a day, my heart finally skipped I beat when I found the movie awaiting me in the familiar red Netflix envelope. Princess Mononoke was the last movie I had to watch before I could officially say that I have watched all of Miyazaki’s directed movies, and it was on the “Top 100 Movies to See Before You Die” List. This movie was a two-in-one dream! So, that just proved that I didn’t want to watch it, but that I needed to. What can I say? Hayao’s stories are always so original, wonderful, and creative, with stunning animation. It’s like his mind is endlessly overflowing with fantastical stories. You can tell that his imagination truly has no walls, and is just as big as a child’s in the age of fairytales and pirates. Princess Mononoke is long and hearty like a bowl of noodles. Well, the movie is long, like how noodles are suppose to represent a long and happy life. It’s a little more than two hours, because there’s a lot of detail going into the storyline. There are demons, tree spirits, talking animals, red elks, fortune telling, decapitation(no joke. ), gods, princes, and princesses, which all make for a pretty enchanting 2 hours. On the other hand, it’s hearty, because it has everything you could ask for in a movie- adventure, humor, action, romance, evil, good, mystery, wonder, and even a little violence mixed in (note back to word decapitation). I was pleasantly surprised, because I’ve never seen his more serious and deeper side of storytelling. It also portrays a really important message he make very clear. So if you were even the least bit interested in what I wrote, go see it. You’ll be doing yourself a favor. Still need more convincing? 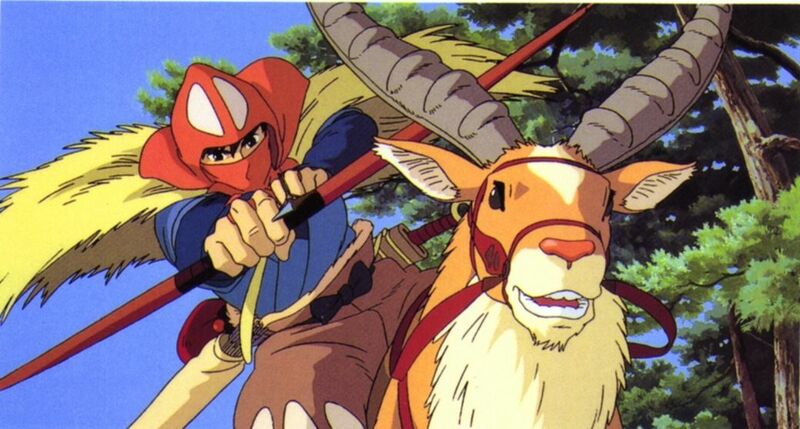 Princess Mononoke made critic Roger Ebert’s list of 1999’s 10 Best Films and is considered an anime epic. This entry was posted in Movies/Shows and tagged fantasy, Miyazaki, Princess Mononoke. Bookmark the permalink.